Aiming for multi-process high precision machining, we created the AH-400 series which is based on our advanced technologies. 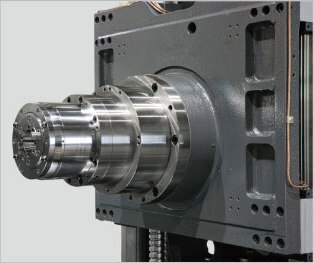 A combination of high rigidity symmetric structure, 12,000 rpm built-in spindle, index table, and 48 m/min. 3-axis rapid gives you high speed, high accuracy and heavy cutting capabilities into one single machine. High precision components such as automobile crank cases and engine blocks can be easily done while meeting stringent quality requirements. The heavily ribbed, thermally balanced bed and columns uses FC 300 “ Meehanite ” casting structures and Finite Element Methods ( FEM ) to ensure overall machine rigidity and loading balance. The double-decked bed with optimal reinforced ribbings enables the cutting force to be evenly distributed to the bottom while meeting high accuracy requirements under long term machining conditions. Central chip removal design enables the heat to escape directly into the air, not trapped inside the machine; this tremendously improves the machine’s overall accuracy by lowering thermal expansion effects to a minimum. Standard CAT40 12,000 rpm built-in spindle provides 167 N-m high torque output at 600 rpm. The main / sub-design allows larger coolant tank capacity while preventing coolant temperature from influencing machining qualities. 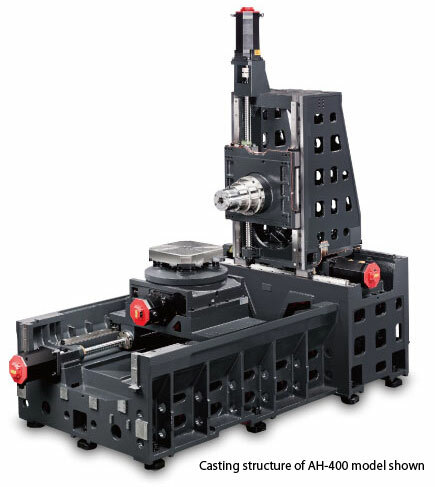 The THK SNS roller linear guide ways on 3 axes provides dynamic load rating superior to peer models and high rigidity form precision horizontal machining applications. Working table is adopted with 4-point supporting design with worm gear driven B-axis. The B-axis resolution is up to ±5 sec ( with HEIDENHAIN encoder ) which highly increases positioning accuracy. Pallet change time : 10 seconds. 19.7" / 22.0" / 23.6" 51.2" / 40.2" / 41.3"
3.9" ~ 27.6" 5.9" ~ 47.2"
2.0" ~ 24.0" 3.94" ~ 44.1"
3.1" / 5.9" 5.0" / 9.8"
189" x 82.7" x 96.5" 27.6" x 164.2" x 145.7"